During the early part of the Easter break, around 50 Year 10 pupils headed to Berlin for the annual GCSE History trip. 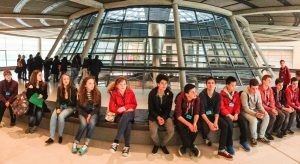 Despite a long delay on the coach journey to the city, the group arrived in time to tour the Reichstag. 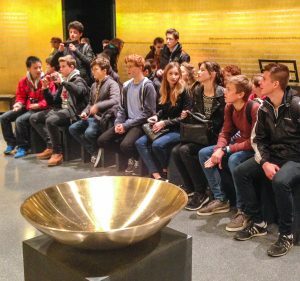 This visit, like so many places in Berlin, challenged pupils to consider how Germany’s past and present interact; how the past might be remembered and for what purpose. The following few days saw the group visit just a handful of Berlin’s excellent museums and fascinating historical sites, including the ‘Topography of Terror’ (site of the SS and Gestapo headquarters during the Third Reich), the 1936 Olympic Stadium, the TV tower, the Brandenburg Gate, Alexanderplatz, Sachsenhausen, the Museum of German Resistance and the beautiful town of Potsdam. Much to the surprise of staff and pupils it turned out that the hotel we stayed in even had an important historical link as it used to be the barracks of the former East German secret police, the notorious Stasi!